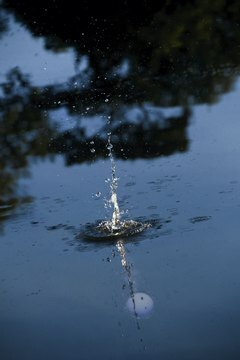 You may test a golf ball's structure using water. But put the ball in a glass, not a pond. On the outside, a golf ball appears to be a perfect sphere, except for the dimpled surface. But there may be imperfections beneath the skin of some golf balls. Among those who’ve warned the public about these structural anomalies is golf coach Dave Pelz. In his book, “Putt Like the Pros,” Pelz (a former NASA scientist) had a putting machine strike unbalanced balls -- balls that were slightly heavier in one spot than another. Pelz states that the worst balanced balls wandered 2½ inches off course during a 10-foot putt. While some manufacturers advertise golf balls as being perfectly balanced, there’s a simple way you may test your golf balls to be sure. Mark the top of the ball with a felt tip pen or marker. Hold the ball beneath the water and spin it. Note whether the marked spot rises to the top, then repeat the procedure. If different points of the ball rise to the top of the water, the ball is balanced. But if the marked spot floats to the top each time, the ball is unbalanced, according to Sherman, because the ball’s heavier side will always rotate to the bottom.